Unlike the lovable madness of Hanoi, Sapa is relatively quiet - letting the picturesque landscapes do the talking. Set in the Hoàng Liên Son mountains, not far from the Chinese border, this hill station town is rich in culture giving you a glimpse of real Vietnam. Best known for incredible views, trekking and seeing hill tribes Sapa is of course popular with tourists. Tip: avoid visiting at weekends when there is a huge influx of Chinese tourists and accommodation prices shoot up! Getting to Sapa from Hanoi is pretty straightforward; there are multiple tour operators selling bus tickets, or you can catch the train. We read a couple of posts on how to make the journey by train; here and here. We decided to get a sleeper bus which cost us $13 each (June 2016) and took around seven hours - the sleeper bus seats are pretty comfortable if you're not too tall! We stayed in two different hotels during our time in Sapa; first, Sapa Elegance Hotel at just under £20 a night. This was well placed up a steep hill, a few minutes walk from the main drag. The room was nice, but not on the same par as similarly-priced accommodation in Hanoi - it all felt a little dated if I'm honest! The second place we stayed was Sapa Eden Hotel. This was less well placed, but perhaps a slightly nicer room than before. We really struggled to get somewhere to stay at the weekend as everything got booked up in advance - beware! Sapa was more of a 'base' for us, as we planned to go on a motorbike adventure with some friends. So we spent a day or so organising our route, hiring a suitable bike and doing a little exploring. We did a practice run with our bike to Love Waterfall (Thác Tình Yêu) which was pretty spectacular! So many waterfalls we visited in SE Asia were dry, so it was amazing to see one so beautiful - we even saw a rainbow stretching across it. The walk from the car park was itself scenic with water buffalo grazing and streams to hop over, the water itself was actually freezing though! The dip of a toe was enough of a taste. Vietnamese and Chinese tourists seemed particularly enamoured with my blonde(ish) hair and white(ish) skin and I spent a good amount of time having my photo taken with random women... all part of that SE Asia experience! Beware of touts; the hill tribe women look incredible in their authentic clothing, but they will (sadly) try to rip you off. Be wary of those offering 'shopping' trips and trekking experiences. We enjoyed eating in Viet Emotion during our time in Sapa; the various bánh mìs were delicious and outside seating the perfect people-watching spot. 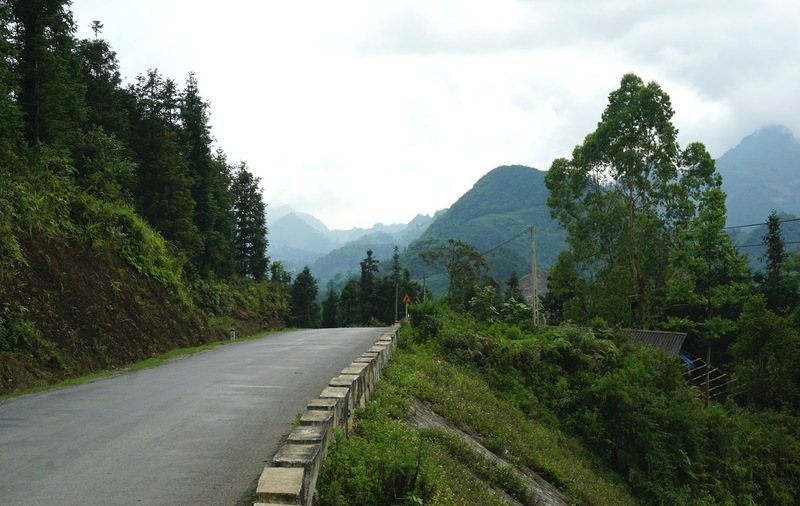 Many come to Sapa as a starting point of a motorbiking trip. The roads here provide some absolutely stunning views; the Heaven's Gate pass (Quản Bạ) being well known for its other-worldly scenery. We decided on a four day, three night round trip from Sapa. We used Google Maps to plan our route. We left Sapa around lunch time, after our friends had to see to some last minute bike repairs. The road from Sapa to Lào Cai took an hour or so and started our trip with some gorgeous views! We had to remind ourselves that we couldn't stop at every turn or bend to take a picture... as much as we wanted to. We stopped after a couple of hours for some lunch at a random road-side restaurant, and with the help of Google Translate successfully ordered some delicious phở bò (beef noodle soup) to fill our bellies. Back on the bikes and after another couple of hours or so we arrived at our first stop; Xín Mần (approx 130km driving). The road in to Xín Mần was pretty hideous; unpaved and so bumpy! Needless to say my rear was pretty painful by the time we stopped. We found a reasonably priced guest house (they all charged the same rate; around 200,000 dong or ~£8 in June 2016) and walked to the empty restaurant over the road for dinner. The family there served us a delicious meal of grilled meat, steamed rice and veg... I can't tell you more than that as we have no idea what we asked for or received! Weird observation: the mattresses in pretty much every hotel we went in to were rock hard. Don't bother 'shopping around' for a hotel with comfy beds; they don't exist! We left Xín Mần at around 9am, after a round of espressos from our friends' gas-fuelled coffee machine and a bite to eat. Lunch this time was less of a success with some hideous tripe soup being served - needless to say we made polite noises and sipped on a little broth before paying up and making our escape! You win some you lose some. By the end of day two we had made it to Hà Giang (around 150km), where we checked in to rooms at the Huong Thao 2 Hotel - the family owners were super friendly, with the little girl becoming my new best pal and adding me on Facebook. We walked down the road for a bite to eat, before heading back to the guest house for beers and a chat with some other Westerners. These were the only Westerners we saw in the four days of our trip! We again headed off fairly early, stopping for something which resembled bún chả for brunch on our way out of the town. It always felt like such a victory when we were given delicious food, given we spoke very little Vietnamese and the locals little English! The roads in and out of Hà Giang were blissful - smooth and comfortable - but this naturally didn't last and soon we were back on bumpy hellish roads leading to our next and final stop. After 130km of sore bums but amazing views we arrived in Phố Ràng. After dropping our bags at a fairly grim guesthouse, we walked down the road to a dinner spot for roasted duck and steamed rice, before returning to our hotel for card games and Cuba Libres! Back to Sapa - 100km - and celebrating our trip with a bottle or two of Dalat wine! 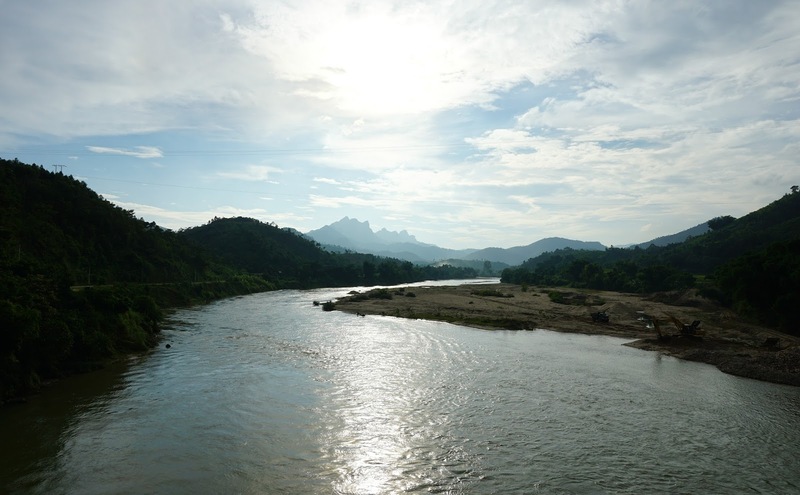 Our motorbike trip round North Vietnam was such a trip highlight - the scenery was just incredible, and nothing else we saw in SE Asia could match it. In Indonesia we visited rice terraces and trekked some pretty impressive mountains, but Hà Giang totally spoilt us! I wish I had more pictures, but it was one of those occasions where the reality was so breathtaking the images just don't do it justice. If you don't fancy organising a trip on your own, many companies offer guided motorbike trips from Hanoi or Sapa. My friends at Vietnam in Focus (read about the photo tour I did in Hanoi here) put on totally incredible-sounding multi-day packages exploring Northern Vietnam. Take a puncture repair kit for your bike - we didn't, and in hindsight feel we were lucky nothing went wrong! Some of the roads are pretty bumpy, and you can be miles away from the nearest village to seek help. Look out for xe máy signs - translates to motorbike, but usually means there is someone who will help you out mechanically if needed. Make sure you get a price quote before hand and don't accept their first price. Google translate is your best friend! There are very few Westerners in Northern Vietnam, so most locals don't speak any English. Download the Vietnamese language on the app so you can use even when you have no internet access. Take your bike for a test drive to ensure it drives well and doesn't have any obvious problems. Unless you have any bike knowledge it can be difficult to spot any mechanical errors, but be savvy... and haggle! I have visited Vietnam a couple times now and it's because of the great www.greenvisa.io visa service. If you want to go there as well, get some help from this visa service.